Seems like a good price for a very capable PC setup. Plus with the cashback, free games and finance I'm tempted to overhaul my aging rig. It’s £79 more though, has a worse CPU and an uglier case. You are also ge …It’s £79 more though, has a worse CPU and an uglier case. You are also getting some games and a monitor with this deal which even if you don’t want the monitor you could sell and get maybe £100. With the extra £79, the money you get from selling the monitor (and maybe from the games if you don’t what them) you could buy more ram and a SSD and add it yourself. And the 1060 will be more than enough for the time being until the GPU prices come down. Sorry but you are wrong in my opinion. Have you looked at the price of RAM? 8GB is going to be £50-£60 more. Then the SSD. That's going to cost you at least £80 more (its M2). A 1070 is approx £150 more than a 1060 too. MSI has 2tb vs this ones 1tb. So all in all the MSI has about £300 more worth of parts and will give you much better performance. Yes the MSI doesn't have a generic 22" monitor (worth about £70) or some free games. But I still think the MSI is a better deal. Will this run black desert online smoothly? It’s £79 more though, has a worse CPU and an uglier case. You are also getting some games and a monitor with this deal which even if you don’t want the monitor you could sell and get maybe £100. With the extra £79, the money you get from selling the monitor (and maybe from the games if you don’t what them) you could buy more ram and a SSD and add it yourself. And the 1060 will be more than enough for the time being until the GPU prices come down. Not bad if you like the free games and "if" the monitor is decent. Roughly speaking you are looking at £690 self build minus Monitor, keyboard and mouse. You can pick up Windows for about £10 easily enough. Self build isn't for everyone, so £110 for someone else to do it for you is what you would be paying. Games are a bit of a non-issue. If you buy both processor and motherboard from same supplier, I'm pretty sure they come free that way anyway. For me the issue here is NO SSD. You'd be best with an SSD fitted and add an HD later. Roughly speaking you are looking at £690 self build minus Monitor, …Roughly speaking you are looking at £690 self build minus Monitor, keyboard and mouse.You can pick up Windows for about £10 easily enough.Self build isn't for everyone, so £110 for someone else to do it for you is what you would be paying.Games are a bit of a non-issue. If you buy both processor and motherboard from same supplier, I'm pretty sure they come free that way anyway. For me the issue here is NO SSD. You'd be best with an SSD fitted and add an HD later. Someone tell me if I should buy this or not, been watching all day for a decent prebuilt for decent money and at this stage... I’m just giving up now. Granted no SSD, but you can get the same size for around £65(?). Case is a little less garish. Medion aren't as well known as MSI but I don't think they're untrustworthy. Keyboard and mouse included as well. I would like to know what the PSU wattage is though, as the MSI one is only 450W, which doesn't seem like enough for a 1070. Don't expect the peripherals to be any good, rather pretty bad since they seem like the extremely cheap ones. Monitor doesn't even seem to be branded. Would be much better if this crap wasn't included so such a price increase wouldn't be justified. For custom build, this is more around the £630-640 mark. Monitor and peripherals of this quality probably cost about under £100 altogether. Games cost about £80-90. 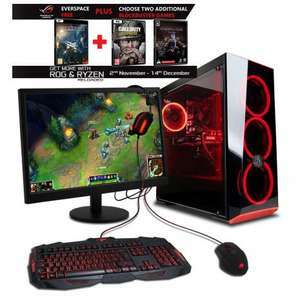 Not that bad of a deal for a pre-built, but honestly, the peripherals and monitor don't look any good and you'd probably need to spend more on mouse, keyboard and headset at least on top of this. Will this play Tetris without lag? How do you get the 47 cashback? So will this play Black desert online without any lag? Also plug and play I assume? So will this play Black desert online without any lag? Also plug and play …So will this play Black desert online without any lag? Also plug and play I assume? Yes and yes. Other than the initial Windows set up, you shouldn't have to do much else to get it up and running. I probably would have saved £180 and gone with this …I probably would have saved £180 and gone with this https://www.box.co.uk/Medion-Erazer-X5361-G_2136595.htmlGranted no SSD, but you can get the same size for around £65(?). I've been looking myself and this seems pretty good. A 1070 is still a perfectly good card and for less than £100 I can put in an SSD for the OS. Though seller seems to be missing....oops.